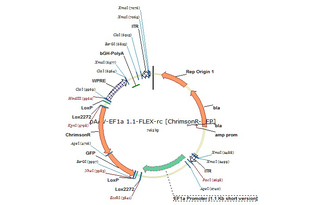 AAV-mediated expression of ChrimsonR-GFP under the EF1α promoter (1.1kb short version), in floxed/reversed (Cre-dependent) manner. Using bGHpA signal. Can use DH5alpha at 37°C or Stbl3 at 30°C. Carbenicillin is preferred over ampicillin. 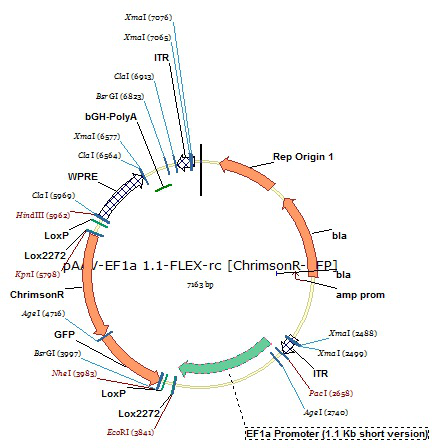 In DH5alpha this plasmid may act more like a high copy plasmid, although in Stbl3 it may act more like a low copy plasmid. 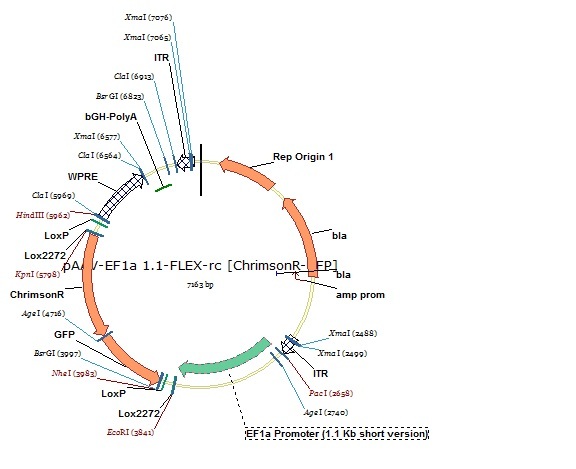 The plasmid is fully sequenced in the coding sequence regions (opsin-fluorophore and important flanking regions). Multiple digestions were done to verify the vector structure. The construct and the virus were both tested in vitro.